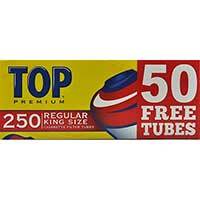 Top Cigarette Tubes are just that – “top” notch tubes that make your smoking experience so much better! The premier brand of tubes has a long history in the tobacco industry and they’re known for their quality and consistency in all their products. These tubes come in a 250-count box and are available in Regular, Gold and Menthol. When looking for a top cigarette tube for your smokes, you’ll want a top brand in the industry and that’s exactly what you get when you choose Top Cigarette Tubes. Once you try them, you’ll be able to see for yourself how well-made and amazing these tubes are. The tubes are easy to use and you can fill them with your favorite tobacco blend.